With the ready-to-use UNIGATE IC POWERLINK, development costs and time-to-market of the final product can be significantly optimized compared with an interface developed by customers themselves. 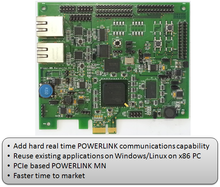 UNIGATE IC POWERLINK consists of a microcontroller, Flash, RAM, and two Ethernet POWERLINK interfaces including PHYs. The module can be connected via a UART interface to the microcontroller of the terminal device. It is also suitable for stand-alone operation. An easy-to-learn, self-explaining script language allows for the connection of the all-in-one bus node and the terminal device. Deutschmann’s Protocol Developer is a free tool for generation of the script. It is easy to use and specifically optimized to the bus communication. The programming allows the mapping of complex applications, which cannot be presented via a pure configuration. PC cards in all formats (PCI, PCI Express, Compact PCI, Low Profile PCI Express, Mini PCI Express, Mini PCI, PC/104, PC/104+, PCMCIA, PMC, PCI 104) for all protocols. 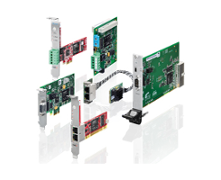 The cifX PC card family offers the user a unified standard supporting all Real-Time Ethernet and fieldbus systems for PC-based automation.The entire protocol stack is processed on the PC card. The process data exchange with the host is executed via Dual-Port-Memory or DMA (Direct Memory Access). Thanks to the uniform Hilscher platform strategy, all PC cards use the same drivers and tools, irrespective of protocol and card format. Communication protocols can be changed easily by loading the appropriate firmware. 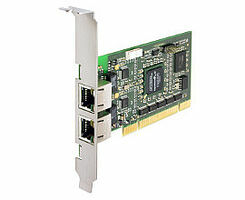 A rotary switch allows a simple and reliable slot assignment of the PCI and PCI Express card types. Moreover, special types are available, e.g. 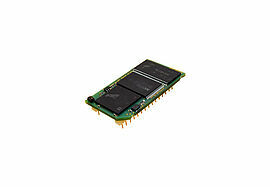 with integrated NVRAM, 2-channel cards or detached network interface. IXXAT INpact allows you to connect a PC to any industrial network. 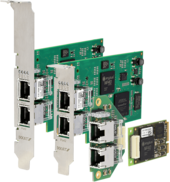 The interfaces for PCIe and PCIe Mini are available in two different versions: Firstly, as dedicated versions for each network with pre-installed network protocols, and secondly as a highly flexible and open version to which the desired industrial Ethernet protocol can be flashed. This feature allows easy switching between all available protocols in a quick and cost-efficient manner without any additional costs, even more simplified by the common application interface. For customers who want to add hard real time POWERLINK communications capability to their Windows/Linux PC based applications, Kalycito offers the MN PCIe reference design.